Lake Geneva or Lake Léman (French Lac Léman, le Léman, or Lac de Genève) is the second largest freshwater lake in central Europe (after Lake Balaton). The southern shore of the lake is in France, taking in the mighty Savoy Alps as well as Mont-Blanc a little further south. The northern, Swiss, shore forms the economic and cultural focus of Suisse Romande, centered around Lausanne. Sixty percent of the lake comes under the jurisdiction of Switzerland (cantons of Vaud, Geneva, and Valais), and forty percent under France (Haute-Savoie). Lake Geneva is famous for its deep, blue and remarkably transparent waters; numerous resorts and villas are built along the lake shore. The northern (Swiss) shore is bounded by sloping vineyards and orchards. The lake is subject to seiches, tidal fluctuations that can suddenly raise or lower the level of the lake. A region of great scenic beauty, Lake Geneva has been an inspiration to many artists and writers, including Rousseau and Byron. Lake Geneva lies on the course of the Rhône River. The river has its source at the Rhone Glacier near the Grimsel Pass, to the east of the lake, and flows down through the Canton of Valais, entering the lake between Villeneuve and St. Gingolph, before flowing slowly westward towards its egress at Geneva. Other tributaries are La Dranse, L'Aubonne, La Morges, Venoge, and Veveyse. Formed by a withdrawing glacier, the lake is in the shape of a crescent, narrowing around Yvoire on the southern shore, and can be divided into the Grand Lac (Large Lake) to the east and the Petit Lac (Small Lake) to the west. Approximately 8.7 percent of the population of Switzerland (650,700) lives in the Lake Geneva region. The most populated city on the lake is Geneva (185,526), and the second is Lausanne (128,302). The shore between Nyon and Lausanne is called La Côte, and between Lausanne and Vevey it is called Lavaux. J.M.W. 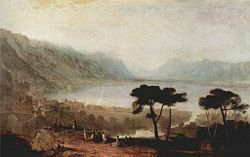 Turner: Lake Geneva from Montreux, 1810. The first recorded name of the lake is Lacus Lemannus from Roman times; it became Lacus Lausonius, Lacus Losanetes and then the Lac de Lausanne in the Middle Ages. Following the rise of Geneva it became Lac de Genève (also translated into English as "Lake Geneva"). In the eighteenth century, Lac Léman was revived in French. It was formerly called Lac de Genève in Geneva and Lac Léman elsewhere but the customary name in French is now Lac Léman. Certain maps name the lake the Lac d'Ouchy (after the port located on the Lausanne lake shore). In English, the name Lake Geneva is predominant. Italian: Lago Lemano, Lago di Ginevra /'lago di dʒi'nevra/. Early Celtic tribes who lived in the region around Lake Geneva left no written records. The written history of Lake Geneva began with the Roman occupation of Switzerland in 58 B.C.E., when Julius Caesar defeated the Celtic Helvetians and forced them to return to their homes in Switzerland instead of settling in Southern France. The Romans occupied the area known today as Switzerland up to Rhine River, and set up their military headquarters in Avenches (Aventicum), which today is only a small village. The Romans founded the two major cities of the Lake Geneva region, Geneva and Lausanne. When Christianity spread through the Roman Empire, Geneva became the seat of a bishop. Around 400 C.E., several Germanic tribes breached the Roman fortifications and conquered the western part of the Roman Empire. The Francs settled in what is now northern France, and the Burgundians settled in western Switzerland and Burgundy (southeastern France). Both tribes originally spoke ancient German, but learned Latin because they were eager to assimilate Roman culture, eventually developing the French language. About 800 C.E., the French Emperor Charlemagne unified France, Germany, Italy, and Switzerland and set up an administration based on dukes and counts. The counts of Kyburg (a castle near Winterhur, eastern Switzerland) were able to gain control over a vast territory reaching from Lake of Constance (northeastern Switzerland) to Lake Geneva. The last count of Kyburg died without heirs, sparking a disagreement between Count Rudolf Habsburg (later to become king of Germany) and Count Peter I of Savoy. In 1266, Savoy conquered the Vaud region north of Lake Geneva. Because of the rising importance of the Savoy and their strategic control of the alpine trade routes, the German Emperor granted the title of Duke to the counts of Savoy. The city of Geneva was a constant object of disputes among the bishop of Geneva, the counts of Geneva and the counts of Savoy. The right of sovereignty over Geneva was granted to the bishop in 1124, and again in 1219, but the political situation there was always unstable. In 1263, the citizens of Geneva allied with Count Peter II of Savoy because they believed that the counts of Savoy could best guarantee the protection of commerce and of the roads leading to Geneva. In 1285, Count Amadée V of Savoy became protector of the city of Geneva. In 1355, the dukes of Savoy took control of Faucigny and Gex under and in 1358, the count of Geneva became a vassal of the Duke of Savoy. The citizens of Geneva now feared the strength of Savoy and became supporters of the bishop of Geneva. In 1387, bishop Adhemar Favre again confirmed the traditional sovereignty of the bishop over the city. In 1519, Duke Charles III of Savoy occupied Geneva with his troops to forestall a pact negotiated by a group of its citizens, the so-called "Eydguenots," with the city of Fribourg. Another pact in 1526, between the citizens of Geneva and Fribourg and Berne, provoked an attack by Duke Charles III of Savoy in 1530. Geneva was besieged by 10,000 soldiers, and Berne, Fribourg, Solothurn, Bienne, Neuchâtel, and Payerne came to its assistance. The citizens of Geneva then rejected the sovereignty of both the Dukes of Savoy and the bishop of Geneva, and formed a general council, an ordinary council and four syndics to take charge of the affairs of the city. Charles III of Savoy refused to renounce his sovereignty over Geneva, and in 1534, he attempted to isolate the city by blocking all its supply routes. In 1536, while Charles III of Savoy and his troops were in northern Italy dealing with political instability there, Berne conquered the county of Vaud in 1536. The other Swiss confederates feared that Berne had become too strong, and came to an agreement with Savoy. The treaties of Lausanne (1564) and Thonon (1569) restored the sovereignty of the Dukes of Savoy over Ternier, Thonon, the Country of Gex and Evian, and the valley of Abondance, in the regions south/west of Lake Geneva. In 1532, the citizens of Geneva resisted an attempt by the Lutheran William Farel to establish a Protestant reformation. In 1533, he returned to Geneva under the protection of Berne, which threatened to withdraw its support of the Dukes of Savoy if they continued to reject the Reformation. The bishop of Geneva, who sympathized with the dukes of Savoy, was banished. In 1536, after being expelled from Paris, the French jurist John Calvin (1509-1564) passed through Geneva and was persuaded by Farel to stay and assist him. Together with Farel, Calvin attempted to institute a number of changes to the city's governance and religious life. They drew up a catechism and a confession of faith, which they insisted all citizens must affirm. The city council refused to adopt Calvin and Farel's creed, and in January 1538, denied them the power to excommunicate, a power they saw as critical to their work. The pair responded with a blanket denial of the Lord's Supper to all Genevans at Easter services. For this, the city council expelled them from the city. Farel died in Neuchâtel; in 1541, after a number of his supporters won election to the Geneva city council, Calvin was called back to Geneva and continued his work in the church there. In 1602, Duke Charles Emmanuel of Savoy once more made an effort to conquer the city of Geneva. According to an ancient ballad, Cé qu'è lainô, Savoy troops attempted to use black ladders to climb the walls of the city of Geneva during the night, but were repulsed thanks to two courageous women, Mère Royaume (Mother Kingdom) and Dame Piaget (Lady Piaget) who discovered the attackers. Every year in December, the Genevans celebrate their triumph over the Dukes of Savoy. In 1798, during a revolution supported by France, Vaudois freedom fighters gained control of the lakeside estates of Berne and the agricultural heartlands. Napoleon formally created a new canton from the territory, and in 1803, it joined the Swiss Confederation. The area retains its French heritage and shows marked cultural differences and political attitudes from German-speaking eastern Switzerland. Today Geneva, once a haven for free-thinkers from all over Europe, is known as an international diplomatic and business center. Lausanne has a large population of young people and is known for its culture and energy. By the 1960s, Lake Geneva had ceased being a transport artery for commercial and construction materials. In the late 1960s, pollution made it dangerous to swim at some beaches of the lake; tourists taking a ride in the local submarine had near zero visibility. By the 1980s, intense environmental pollution (eutrophication) had almost wiped out all the fish. Today, pollution levels have been dramatically cut back, and it is safe to swim in the lake. The main leisure activities are sailing, wind surfing, boating (including water skiing and wakeboarding), rowing, scuba diving, and bathing. Tourism is a major source of income. Mont Blanc, western Europe's highest mountain (4807 m), can be seen from the city center of Geneva, and Montreux and neighboring Vevey have breathtaking views across the water to the French Alps. Travelers can enjoy scenic train rides around the shores, or take advantage of the lake’s excellent boat service. The Lake Geneva Region has nearly one hundred castles, eighteen of which are open to the public. Grandson, on the banks of Lake Neuchâtel, is one of Switzerland’s largest fortifications. Another legendary castle the Château de Chillon, on an island in the lake near Montreux. Built by the Dukes of Savoy in the thirteenth century to control control the passage to the Grand St. Bernard pass, the castle is in a remarkable state of preservation. Lord Byron, inspired by a historical episode involving the imprisonment of Bonivard in the sixteenth century, wrote the famous poem, "The Prisoner of Chillon:"
The Lake Geneva Region is also home to eighty museums on biology, archaeology, history, key figures, fine art, industry, handicrafts, art deco, transport, the Olympics, and the history of the castles. Roman ruins, amphitheaters, castles, churches, monuments, and some 200 archaeological sites commemorate the history of the region. The scenic beauty of the region, with its soaring mountain views and terraced vineyards, has inspired visitors for centuries. Musicians Tchaikovsky, Stravinsky, and Clara Haskil, and the painter Gustave Courbet, spent time in residence there. Writers including Lord Byron, Rousseau, Voltaire, Goethe, Dickens, Tolstoy, and Simenon vacationed in the region and found inspiration for their work. Mary Shelley wrote the first draft of Frankenstein while staying with her husband, Percy Shelley, and Byron, in a villa on the shores of Lake Geneva. Charlie Chaplin lived there for the last twenty-four years of his life, and actors Audrey Hepburn and David Niven also lived there. On June 2, 2007, the Lavaux region received the designation of a UNESCO World Heritage Site, under the category of a cultural landscape, in recognition of the beauty of its vineyards, terraces and villages facing the Alps and Lake Geneva. The area is often referred to as the “Three Suns” for the elements of its scenic landscapes, the sky, the lake and the walls. 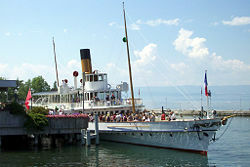 CGN paddle steamer Montreux leaving Évian-les-Bains in July 2002. Shelley, Mary Wollstonecraft and Percy Bysshe Shelley. 1817. History of a Six Weeks' Tour Through a Part of France, Switzerland, Germany, and Holland with Letters Descriptive of a Sail round the Lake of Geneva, and of the Glaciers of Chamouni. London: T. Hookham, jun. This page was last modified on 20 June 2018, at 14:32.